Wash, peel and cook potatoes in water with two teaspoons of salt. When ready, drain and let them cool. Cut into slices. Boil water with eggs over medium high heat. Cook eggs for 10 minutes starting timing when water boils; place eggs in cold water. Let them cool; peel when cool enough to handle. Heat oil in a skillet over medium high heat. Cook the garlic, onion and chopped peppers. Brown the peppers on all sides for a minute. If time does not allow to brown, use instead yellow pepper paste. Use about 3 teaspoons, depending on level of spiciness desired. In a blender, blend the garlic, onion, the peppers or yellow pepper paste, and the cheese and evaporated milk; season with salt and pepper. Add the lemon juice. Serve potatoes sliced over lettuce leaf; pour cream sauce mixture over potatoes. 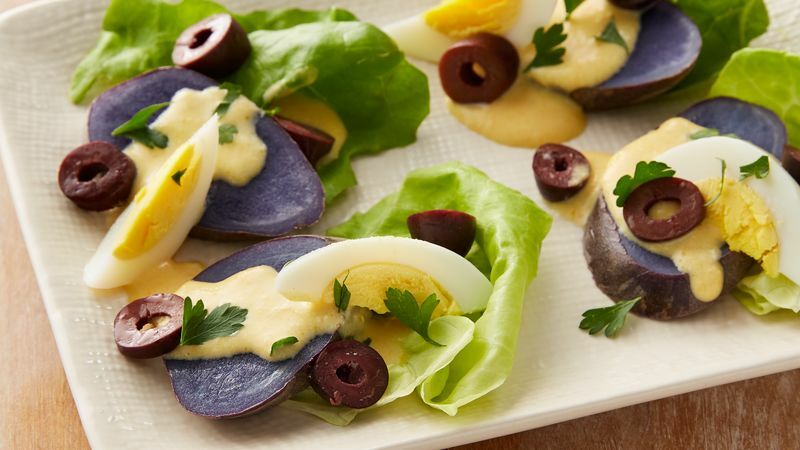 Garnish with boiled eggs, halved; parsley and black olives. If cream sauce is too thin, you can thicken it with crackers. If it’s too thick, add a splash of milk but not too much, because it is best enjoyed when thicker. The cream mix can be used on chicken, pasta and even French fries. It’s one of Peruvian cuisine’s the most delicious dishes, and as a side dish accompanies grilled shrimp, ceviche, chicken and even pasta. It's called "Andean Potatoes" because it comes from the city of Huancayo, Perú. Its flavor has been a source of pride for Peruvians all around the world, and now you can enjoy it at home. Initially prepared hot pepper based, the recipe now uses aji amarillo or Peruvian yellow pepper. The cheese used to be ground up in a mortar, but it’s generally now prepared in a blender.